1.1 This Standard Radio System Plan (SRSP) states the minimum technical requirements for the efficient use of the frequency band 7125-7725 MHz by low, medium, and high-capacity (LC, MC and HC) digital point-to-point radio systems in the fixed service. 1.2 This SRSP is intended to be employed in the design and specification of radio systems and equipment and in the evaluation of technical applications for new radio facilities or modification to radio systems submitted in accordance with the current issue of RSP-113. 2.1 This Standard replaces SRSP-307.1, Issue 4. Revision of this SRSP will be made as required. 2.3 The arrangements for non-standard systems are outlined in SP-Gen.
2.5 Modifications may be required to a radio system whenever harmful interferenceFootnote 2 is caused even when the system conforms to the requirements of this SRSP. 2.6 When potential conflict between radio systems cannot be resolved, Industry Canada should be advised. After consultation with the parties concerned, the Department will determine the necessary modifications and schedule of modifications to resolve the conflict. Use of frequency diversity by systems serving telemetry, control and protection purposes is allowed. In these cases however, it should be recognized that space diversity techniques will be encouraged. In cases where route diversity is used it may be necessary to deviate from the preferred two-frequency plans, and such systems will receive the same degree of protection as the preferred system. The use of frequency diversity and route diversity could be considered if economic or technical justification is provided. The applicant must provide all necessary particulars in the licence application together with the overall frequency plan proposed. 2.9 It should be noted that the fixed service shares this band with other services in accordance with the Canadian Table of Frequency Allocations . The current issues of the following documents are applicable, and available on Industry Canada's Spectrum Management and Telecommunications website at: http://www.ic.gc.ca/spectrum. 4.1.1 The radio frequency channel arrangements defined in this Standard provide for 6 different RF channel bandwidths. Channel pairs are provided with a common transmit/receive separation of 175 MHz and 150 MHz in sub-plans I and II respectively. Figure 1 illustrates the band structure. See also, Annex A. 4.1.2 The GO/RETURN 30 MHz channels will be allowed for use by the Power Utilities on a preferential basis. 4.1.3 In the case of spectrum congestion, the spectrum assigned for 30 MHz channels will be open for users of applications of 20 MHz and less. RF channel bandwidths of greater than 20 MHz and less than or equal to 30 MHz. These correspond to channels A1/A1' to A4/A4' in sub-plan I and channels A5/A5' to A8/A8' in sub-plan II. RF channel bandwidths of greater than 10 MHz and less than or equal to 20 MHz. These correspond to channels B1/B1'to B6/B6' in sub-plan I and channels B7/B7' to B13/B13' in sub-plan II. RF channel bandwidths of greater than 7.5 MHz and less than or equal to 10 MHz. These correspond to channels C1/C1'to C12/C12' in sub-plan I and channels C13/C13' to C27/C27' in sub-plan II. RF channel bandwidths of greater than 5 MHz and less than or equal to 7.5 MHz. These correspond to channels D1/D1'to D16/D16' in sub-plan I and channels D17/D17' to D36/D36' in sub-plan II. RF channel bandwidths of greater than 2.5 MHz and less than or equal to 5 MHz. These correspond to channels E1/E1'to E25/E25' in sub-plan I and channels E26/E26' to E55/E55' in sub-plan II. RF channel bandwidths less than or equal to 2.5 MHz. These correspond to channels F1/F1'to F50/F50' in sub-plan I and channels F51/F51' to F110/F110' in sub-plan II. where n is the channel number and An and An' are the centre frequencies in MHz of the paired channels. where n is the channel number and Bn and Bn' are the centre frequencies in MHz of the paired channels. where n is the channel number and Cn and Cn' are the centre frequencies in MHz of the paired channels. where n is the channel number and Dn and Dn' are the centre frequencies in MHz of the paired channels. where n is the channel number and En and En' are the centre frequencies in MHz of the paired channels. where n is the channel number and Fn and Fn' are the centre frequencies in MHz of the paired channels. where An and An' are the centre frequencies in MHz of the paired channels. The frequencies assigned to a main route system should be reused on the branching or spur routes where possible. The siting of repeater stations should be planned with this requirement in mind, in order that sufficient antenna discrimination is obtained at the branch-off-angle. In sub-plans I and II, new systems should use the highest available frequency pair that can be successfully coordinated. 4.6.1 For frequency diversity, the channels of sub-plan I should be paired with the following channels of sub-plan II, in accordance with Section 4.5. For digital radio systems with RF channel bandwidths of greater than 20 MHz and less than or equal to 30 MHz: GO channels An/A4+n should be paired with RETURN channels An'/A4+n' where n = 1 to 4. For digital radio systems with RF channel bandwidths of greater than 10 MHz and less than or equal to 20 MHz: GO channels Bn/B7+n should be paired with RETURN channels Bn'/B7+n' where n = 1 to 6. For digital radio systems with RF channel bandwidths of greater than 7.5 MHz and less than or equal to 10 MHz: GO channels Cn/C15+n should be paired with RETURN channels Cn'/C15+n' where n = 1 to 12. For digital radio systems with RF channel bandwidths of greater than 5 MHz and less than or equal to 7.5 MHz: GO channels Dn/D20+n should be paired with RETURN channels Dn'/D20+n' where n = 1 to 16. For digital radio systems with RF channel bandwidths of greater than 2.5 MHz and less than or equal to 5 MHz: GO channels En/E30+n should be paired with RETURN channels En'/E30+n' where n = 1 to 25. For digital radio systems with RF channel bandwidths less than or equal to 2.5 MHz: GO channels Fn/F60+n should be paired with RETURN channels Fn'/F60+n' where n = 1 to 50. 4.7.1 Medium and high-capacity digital systems submitted for licensing shall have a minimum spectral efficiency of 4.4 bit/s/Hz of the RF channel bandwidth on a single polarization. 4.7.2 Low-capacity digital systems submitted for licensing shall have a minimum spectral efficiency of 2.4 bit/s/Hz of the RF channel bandwidth on a single polarization. Single channel systems requiring protection must employ hot standby protection with the exception of systems used for telemetry, control and protection purposes which may employ frequency diversity protection. 5.3 The centre frequency of the emission shall be maintained within ± 0.001% of the assigned frequency. 6.1 The co-polarized radiation pattern envelope in the horizontal plane of the antenna must remain within the envelope shown in Figure 2, for both vertical and horizontal polarizations. 6.2 The antenna shall have a minimum front-to-back ratio of 65 dB. The maximum e.i.r.p. from the antenna must not in any case exceed +55 dBW per RF channel. Return to footnote reference 1 SP 1-20 GHz, January 1995, contains new spectrum utilization principles including the Geographical Differences Policy Guideline. This information will be incorporated into a revision of SP-Gen.
Return to footnote reference 2 For the purpose of this SRSP, "harmful interference" means interference which endangers the functioning of a radionavigation service or of other safety services or seriously degrades, obstructs, or repeatedly interrupts a radiocommunication service operating in accordance with regulations and technical requirements laid down by Industry Canada under the Radiocommunication Act . 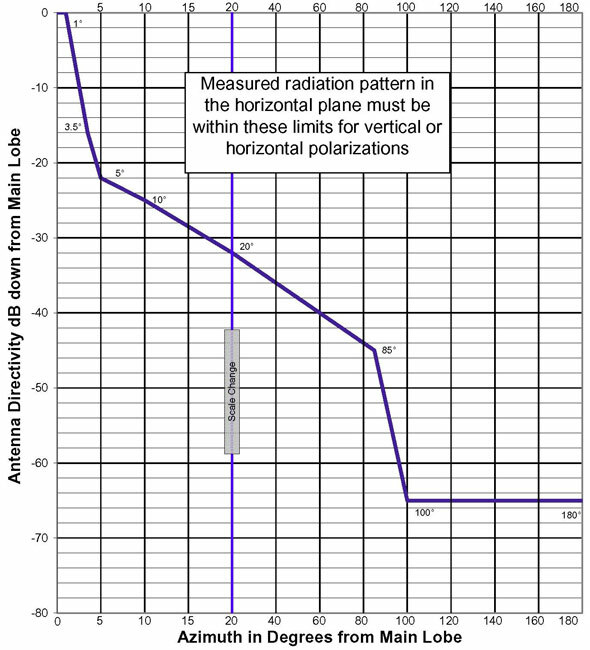 Figure 2 is a line graph that shows the antenna radiation pattern limits in dB down from the main lobe for azimuth separations from the main lobe between 0 and 180 degrees. The y-axis measures antenna directivity in dB down from main lobe from -40 to 0. The x-axis plots azimuth in degrees from main lobe from 0 to 180. There is one plot line which ranges from -38 to 0 on the y-axis. Data points are also given in Table 4. Measured radiation pattern in the horizontal plane must be within these limits for vertical or horizontal polarizations.